Has the Natural Product Industry Gone Too Far? One commonly asked question we get in our 21 day challenges is, “Is this healthy? ?” and attached is a photo of some food that is being labeled as such that a participant has found in their grocery store. Chances are, if you have to ask, the answer is NO. Kelly and I were at the Natural Products Expo West this last weekend. Imagine shuffling through nearly 400,000 square feet with 65,000 buyers, vendors, practitioners, and others interested in, producing, and pimping out their so-called natural products (of which over 3,000 companies are eager to share with you). The sampling is enough to make you physically ill (and in dire need of one of Kelly’s detoxes) and the stimulation of such an event rivals the streets of Manhattan or Vegas! As Kelly observed, it’s like Halloween for nutrition geeks such as ourselves. Has the Natural Products Industry Gone too Far? Everyone there claims to have a natural product. And, to present at the show, you must follow the standards deemed credible by NPEW. But what is natural? Legally, it has no definition. As an industry, we’ve adopted a standard that includes such buzzword definitions as ‘no artificial colors or flavors’, ‘no msg’, ‘no hydrogenated fats’ ‘no hormones added’ and beyond that….well, anything goes, really. That’s why you can go to such an event and get sick on too many gluten-free oreos and receive samples of chalky puffed chia chips reminiscent of styrofoam or a vegan meat that miraculously looks and feels miraculously familiar to the real thing. Here’s my biggest takeaway from ExpoWest 2014 – the natural products industry has gone too far. Really, I knew this, but being in Anaheim last weekend was like having a gluten-free vegan breaded codfish product slapped in my face repeatedly. I got the hint. 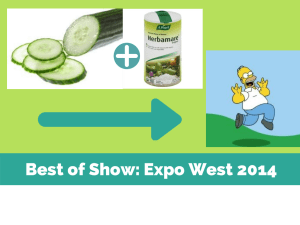 Among all that product, all that sampling and all the genuinely exciting hullabaloo coming to a natural food store near you the product that stuck out the most, that had the strongest resonance and most powerful influence for me was a cucumber slice sprinkled with Herbamare. THIS was all natural. It was like a fresh spring breeze upon my tongue. It lifted my energy and I’m certain it put a joyful twinkle in my eyes and a skip in my step. The sampler said she said many people who stopped by said it was the only vegetable they’d had all day. That gives one pause, doesn’t it? At the end of the day, if you eat packaged good, natural or not, organic or not, GMO-free or not, you are more likely to fall ill than if you eat something that is not packaged. The devil is in the processing. What then qualifies as a processed food? Think you know? Think again! Click here to read about food and processing, and what the processing of even the most natural foods does to the body. According to the USDA, MyPlate became the US government’s primary icon of food groups and recommended diet in June of 2011. MyPlate replaced My Pyramid and the food pyramid concept in general. It is supposed to provide a simple way to help people create healthy eating habits that are “consistent with the 2010 Dietary Guidelines for Americans” (USDA, 2013) by using the “visual cue” of the plate icon. I agree that the new icon of the plate symbol is an advantage in practical application to building a meal, but I find it lacking in some important information. There are a lot of changes and not all of them are good, in my opinion. First of all, one thing that seems to be an egregious omission is the entire concept of fats and sugar from the My Plate picture. I think we can all agree, after last week’s research, that consuming a healthy quantity and quality of lipids is vitally important. Since 1979’s “Hassle-Free Daily Food Guide,” Americans have been given information on how much fat or oil was acceptable in our diet (USDA Center for Nutrition, 2011, June). Information on fats was included on the 1992 Food Pyramid and the 2005 My Pyramid models, both of which clearly demonstrated that fats and oils should be consumed in small amounts. Annual statistics compiled by the US Centers for Disease Control show that more Americans die from heart disease than anything else (US CDC, 2013). Strokes and Diabetes are also in the top ten. Since diet and the consumption of lipids is a huge factor in these illnesses, it seems that dietary recommendations should provide more information on lipids, not less (like the difference between LDLs and HDLs, which I myself didn’t even know until last week). Now, it’s clear that the My Plate program was meant to be accessed online (the icon says ChooseMyPlate.gov) and the icon merely references the 2101 Dietary Guidelines for Americans which does include all the information about how much fat is acceptable in a healthy diet. “Getting Started with My Plate” tells users to reference the Guidelines and to look online for more information, such as how to balance calories, foods to increase, foods to reduce, and what to drink. I think having more detailed online data is great, but to me it seems a travesty that the information about fats is eliminated from the icon because I don’t think a lot of people read the entire guideline and not everyone has internet access or even a computer. Another thing that is missing from the MyPlate icon that was included on the MyPyramid icon is the encouragement to exercise. The MyPyramid stressed the importance of exercise by including a figure climbing the stairs of the pyramid (USDA Center for Nutrition, 2011). Again, the importance of exercise is mentioned on the website and the pamphlet, but it seems that the message is demoted in importance when it gets removed from the icon. These differences are just what I observed from the visual icons. What’s different about the actual plans? First of all, the MyPlate places less emphasis on grains, while the Food Pyramid recommended grains as the largest food group. MyPlate shows only ¼ of the plate for grains, emphasizing whole grains, and shows ½ the plate dedicated to fruits and vegetables instead. This is a positive change since many Americans were not getting enough fruits and vegetables (and fiber!) (Anderson, 2009), and as we just learned, an overconsumption of grains can lead to their storage in the body as fats after the saccharides are broken down. But if consumers replace grains with too many starchy vegetables or fruits high in sugar, they will risk the exact same situation. Another change is the elimination of serving size information. The food pyramid informed us how many servings of each type of food to eat and what a serving size was defined as, whereas MyPlate doesn’t show or talk about number or size of servings. Apparently, nutrition professionals thought this was too confusing and recommended the changes, the assumption being that if consumers eat from a plate nine inches in diameter and don’t make huge piles of food, then they are eating a healthy amount of food. It is thought that eliminating serving sizes makes MyPlate simpler to implement and understand, but I measured my “standard” dinner plate and it was 9 ¾ inches. Measure your dinner plate to see how it compares! The last change I will discuss is the use of the word “ Protein,” which is a nutrient, not an actual food group, and seems out of place. Apparently, the USDA felt that enough people recognized what constitutes protein and knew how to get it in their diets, whether it came from animal sources such as beef or fish, or plant sources like legumes or nuts. The goal was to create something simple that people could interpret according to their own tastes and incorporating all sources. Many people think MyPlate is an improvement over the pyramids; nutrition experts like Registered Dietitian Becky Hand are thrilled. She says. “If your dinner plate matches up with the four quadrants and one circle, then you’ll have a great start to a balanced and nutrient-filled meal!” (Hand, 2011). I think that the actual plan is great, and a huge improvement (especially in the reduction of grains and increase in fruits and vegetables), but the icon leaves much to be desired and leaves out too much vital information. I understand that it must have been a huge challenge to come up with a picture that represents the plan and is easy to understand, and I think using a plate is a great idea, but I think they left out too much important information. The effectiveness of the plan hinges on two crucial factors: the size of the plate and the ability of people to get the complete information from the internet, which is a huge flaw in my opinion. Oversimplifying what constitutes a balanced meal can lead consumers to make poor choices. For example, let’s say someone chooses chicken fried steak for their protein, mashed potatoes and corn for their vegetable, marinated tomatoes for their fruit, whole wheat roll with butter for the grain, drinks a glass of water and has ice cream for their dairy. Since the MyPlate icon doesn’t address fats or sugar at all, the person might think this is a healthy meal, but there is fat or oil in every single item. The potatoes and corn have a high glycemic index and will convert to stored sugar. This person would probably gain weight and be at risk of heart disease before long. The MyPlate program and icon are supported and endorsed by the American Heart Association and the American Dietetic Association (Hand, 2011) as well as the Journal of the American Medical Association (Mitka, 2011), but Harvard University agrees with me. Harvard’s School of Public Health (HSPH) published its own “Healthy Eating Plate” because, as their website states, the MyPlate program “still doesn’t go far enough to show people how to make the healthiest choices” (HSPH, 2011). It was no surprise to me to see that HSPH included information on how to use fats and oils, lowered the amount of fruit and raised the amount of vegetables, addressed excluding potatoes and French fries, defined healthy protein, limiting sugar, processed meats, dairy, and sugary drinks. They completely eclipsed the USDA and created a plate-based icon that actually makes sense, and it’s extremely simple to understand as well as being easy to implement. You don’t even need a computer to access extra information, and it clearly states “stay active” at the bottom. Faculty at HSPH even went so far as to “fix” the flaws in the now out-dated Food Pyramid so that people who are used to the old familiar model can receive the most correct information in a format with which they can identify. Instead of overwhelming consumers with a complicated website, the Healthy Eating Plate and Pyramid comes with five “quick tips”: stay active, eat a plant-based diet, pick healthy protein sources, make your grains whole grains, drink water, coffee, or tea, and drink alcohol in moderation, if at all (HSPH, 2011). This seems so simple, surely Americans could all benefit from the HSPH version of a plate-based model. Since this seems pretty obvious to me, I wondered if any special interest groups had played a role in influencing the structure of MyPlate. Walter Willett, professor of epidemiology and nutrition and chair of the Department of Nutrition at HSPH, said, “Unfortunately, like the earlier U.S. Department of Agriculture (USDA) pyramids, MyPlate mixes science with the influence of powerful agricultural interests, which is not the recipe for healthy eating. The Healthy Eating Plate is based on the best available scientific evidence and provides consumers with the information they need to make choices that can profoundly affect our health and well-being” (Datz, 2011). The food group that seems to be really overemphasized is dairy, and I wasn’t the only one who noticed it. “Calcium is the primary justification for the importance of dairy, but many green vegetables offer just as much calcium as milk, and in a more absorbable form… If science and health were calling the shots, then milk products would simply be absorbed into the protein category as one of many ways to get your essential amino acids, or perhaps into a “calcium” group that would also include dark-green leafy vegetables and fortified dairy alternatives,” reported Ari Levaux in his criticism of MyPlate for a northern Californian newspaper (Levaux, 2011). If our government is so beholden to special interests as to deliver a dietary recommendation that doesn’t give consumers the whole picture and clearly is not an unbiased approach to eating, even while heart disease is the number one killer of our citizens, it does make me fearful as to what else is being perverted by special interests and what else we are not being told. If I’m just a college student and I can see the inconsistencies, how do our leaders account for the limitations of MyPlate? I feel bad for people who aren’t getting the opportunity to learn about things such as the Harvard Healthy Eating Plate. In conclusion, I do not think MyPlate is the “full meal deal” and as per usual, an educated consumer is the best customer. I plan to use the Harvard model myself. (Angela Kokinakos is a nursing student in Seattle, Washington. This inspirational article from the Ballard Farmers Market blog tells the story of how local, sustainably raised and humanely handled meats came to be in Seattle Farmers Markets. This method of production and distribution is a beautiful model that will hopefully be produced across the nation! Congratulations to King County for leading the way in the local foods movement! Radiation Dressing – Coming to a salad near you! The FDA has recently announced that it will be allowing ionizing radiation treatment to fresh spinach and iceberg lettuce. Even worse, because consumers have clearly made it evident that they disapprove of radiation industry has been pushing the FDA to eliminate labeling requirements – so that we have no way to avoid irradiated food products. What does it mean to treat a food with radiation? Ionizing radiation is the equivalent of blasting our produce with tens of millions of chest x-rays. Just as this would be lethal to human beings because it alters cellular structure, it alters the cellular structure of the food radiated and in some foods, creates new compounds which have been recognized as carcinogenic.Â The appearance of these cancer-causing compounds have been confirmed by FDA officials. Little testing has been done to determine the safety of consuming irradiated foods. Rather than irradiation to treat potential food borne pathogens, we need to go to the root of the issue. Unhealthy soil, poor farming practices and lax regulation have allowed the spread of food borne illnesses among crops. Treating farm crops with sewer sludge, planting crops near slaughterhouse run-off, and poorly supervised, underpaid workers all contribute to the weakened infrastructure of our food supply. To change these policies and practices, we must take matters into our own hands. Because of how our government has organized the agriculture in this country, grassroots movements will be the only way to change the direction our food supply is headed. Support Your Local Farmer: Getting to know who grows your food empowers you by knowing more about how your food was grown and allows you to have a significant impact on farming practices by voicing your needs directly to the source of your food. Please ask Congress to step in and protect consumers — email congress asking that they require all irradiated products to be labeled. Consumers have a right to know exactly what they are buying. Food Politics by Marion Nestle – a wonderful book talking about the creation of the first food guide pyramid, public school nutrition, supplement regulation in the United States and delves into just why the marriage of food promotion and food protection is a bad idea. Take action and learn more at the Organic Consumers Association website. From here is a link to comment within the 30 day window allowed by the FDA.Â Aside from voting with your dollar, this is the most powerful way to make your voice heard!